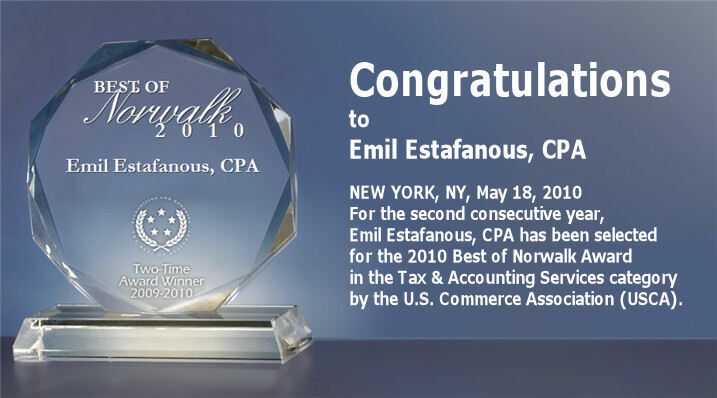 NEW YORK, NY, May 18, 2010 — For the second consecutive year, Emil Estafanous, CPA has been selected for the 2010 Best of Norwalk Award in the Tax & Accounting Services category by the U.S. Commerce Association (USCA). Nationwide, only 1 in 70 (1.4%) 2010 Award recipients qualified as two-time Award Winners. Various sources of information were gathered and analyzed to choose the winners in each category. The 2010 USCA Award Program focuses on quality, not quantity. Winners are determined based on the information gathered both internally by the USCA and data provided by third parties.